In a household of just two people, I used to fantasize about having a second microwave. First thing every morning, I made my daughter’s oat bran while wishing I could be simultaneously boiling water for a cup of tea. And what about when we both wanted a frozen burrito? They never cook right when you do two at once. Yeah, I know, these seem like trivial issues, and indeed they were, which is exactly why I never seriously considered getting a second microwave. But then I joined households with my future husband. He liked his microwave, but he’s a deeply practical guy and doesn’t like clutter. He was fully prepared to get rid of his microwave in favor of mine, but I suggested we keep both. He wasn’t keen on the idea. “We’d lose so much counter space,” he pointed out. I suggested that we try stacking them, and we found that they fit perfectly under the cupboard. And because my husband always lets me have my way, he agreed to it. But do we ever actually use both of them simultaneously? All the time! As much as I used to covet having two microwaves, I had no idea how great it would be. Now there are four of us in the household, so I guess I haven’t really made any headway in per capita microwave availability, but at least it’s still 2:1 and not 4:1. Even though I do a lot more “real” cooking now (not a single frozen burrito in our freezer! ), a microwave still has its place. 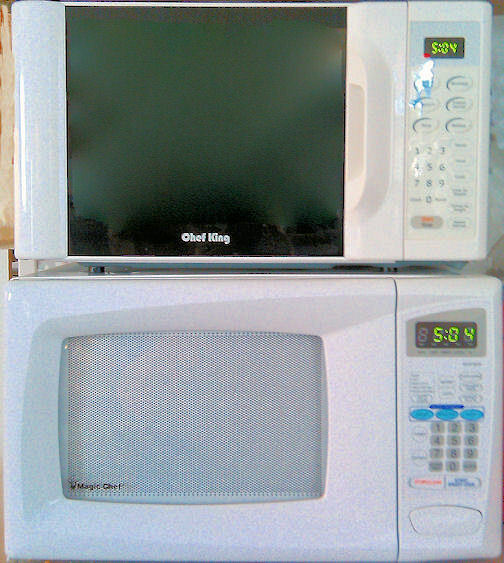 If you need to reheat, melt, boil, or defrost, you can’t beat the microwave for convenience. When I was growing up, we had two ovens in my house, and dual ovens are still not uncommon in “gourmet” kitchens. So why has the concept of dual microwaves never gained popularity? I think we’re ahead of our time here. This entry was posted in Home & Hearth, Marriage. Bookmark the permalink.